Is it Best to Hire a Car Accident Lawyer? What if Fault is Obvious in My Auto Collision? What Damages Can Recover After a Car Wreck? What Does it Cost to Speak to a Lawyer? In 2017, 3721 people were killed and another 17,546 people suffered serious injuries in car accidents in the State of Texas according to a Texas Department of Transportation report. When they occur, auto collisions can be life-changing. From minor fender-benders to major collisions, it is important for drivers to understand their rights and responsibilities when car accidents happen. If you’ve been injured in a car accident due to the negligence of another party, you should be aware that you have the right to speak to a car accident lawyer before giving any statements that can be used against you and that you can do this at no cost. At Simmons and Fletcher, P.C., we handle car accidents every day. Our car accident attorneys offer a free consultation and we charge no fees unless we make a recovery. We will fight to maximize your recovery while assisting you to obtain the medical care you need to get on with your life. The role of defendant driver’s insurance adjuster is to minimize the company’s cost, not to take care of you. Don’t let an insurance adjuster victimize you a second time. Call Simmons and Fletcher, P.C. today at: 1-800-298-0111. First and foremost, if you are involved in an automobile accident you need to assess all injuries and determine if an ambulance is required. Often, individuals experience a rush of adrenaline after a car accident and do not feel their injuries until time has passed. Remaining safe after a car accident is the most important thing, so any injuries sustained should be examined by a medical professional as soon as possible. If you can steer it, clear it. That is the rule in Texas. If you can safely move the vehicles out of traffic to a safe area, you should do so. If you cannot do so safely, you can wait for the police to arrive to assist in this process. Always call the police when an accident occurs. Regardless of the severity, be sure to request an accident report. This helps ensure no facts about the accident can be skewed. There are some habitual bad drivers who use fake insurance information and may change their story after the accident. This is just one step you can take to protect yourself from this kind of negligence. Business cards of the tow truck driver, witnesses, etc. From property damage to insurance cards, documenting each aspect of the initial accident can help ensure you are fully protected. Storing the information in your phone can be beneficial since little things like cards and written notes can be lost easily in the wake of a car accident. Additionally, you should just down in the notes section of your phone the name, address and phone number of any eyewitnesses. All police reports associated with car accidents in Texas eventually end up in the Texas Department of Transportation’s Crash Reporting and Analysis for Safer Highways (C.R.A.S.H.) where you can download them online. The time it takes to get a report may vary depending upon what city or county department the report comes from, but 7-14 days is the norm unless there are special circumstances. Sometimes, you can obtain a copy of the police accident report sooner by contacting the local department that investigated the collision. We have created a free one-page checklist that you can keep in your glove box in the event you are involved in a collision. This will help remind you of everything you need to document when the time comes. Download the free Car Accident Checklist now. What are my duties after a car accident? Tips for filing auto insurance claims. Obtaining the medical care you need after a car accident. What should I bring to the meeting with my accident attorney? Call us to talk to an accident attorney today. We offer a free consultation and we do not charge you a dime unless we make a recovery for you. Dial 1-800-298-0111 now. Review: 5/5 ★ ★ ★ ★ ★ “After the accident I was really shaken to my core. Being a senior citizen, I wasn’t sure just what to do. I saw your tv ad and I decided to call. So glad I did and from day one I was treated very well. Especially since I didn’t have the pertinent information I should have gotten from the person who hit me. In spite of it all, your people were able to get all the information needed for my case. i consider that a job well done. I am truly grateful for all your help.” – Veda J., actual client. If you have been injured in a car accident, then the short answer is “yes.” Sadly, many people wait to talk to a car accident lawyer until after they have attempted to handle the case on their own with a seemingly friendly insurance adjuster who promised they would “take full responsibility” early on and then made a ridiculous low ball offer and quit returning calls later. These kind of tactics cause injured persons to delay in gathering and preserving critical evidence they should be gathering from the start. Furthermore, they cause people to delay in getting medical care they need. The absence of evidence and the delays are then used against the injured victim to justify a low ball offer when it comes time to settle the case. Thus, it is best to get a car accident lawyer involved in the case early when you have sustained injuries. Who is at Fault in a Rear-End Accident in Texas? Contrary to popular belief, there is no automatic liability even in a rear-end accident. Insurance adjusters typically will not help you find an affordable doctor that will treat you without expecting payment up front. They know that if you have no help, you won't be able to seek the care you need. They also know that delays and gaps in care make juries second guess whether you were really hurt. Thus, stalling your case is in their best interest and saves them money in the long run. When an adjuster tells you “we take full responsibility,” it does not mean they will pay all of your medical bills and compensate you fairly for other losses from your car accident. Liability is rarely the big fight. Insurance adjusters know that just because their client is liable for causing the accident, doesn’t mean they must pay for all of the medical care you receive. Texas law only requires them to pay for “reasonable and necessary” medical care that is caused by the collision. If you fail to seek medical care promptly or you seek alternative medicine instead of medical care that conforms with accepted medical care guidelines, defendants can use your actions or omissions against you to convince a jury to not award you all of your bills. Your best course of action is to seek prompt, appropriate care if you have been injured. Payment of property damage to your vehicle is not an admission of liability for your personal injuries suffered in an accident. Don’t be fooled into thinking an insurance adjuster is going to treat you fair on your personal injury claim just because they promptly paid for the damage to your car. Paying for property damage before denying an injury claim is a common tactic used to try to prevent a jury from ever seeing photos of the property damage. When your case goes to trial, you are typically not even allowed to tell the jury that the insurance company paid for the property damage their insured caused. Recorded statements can be used against you. Your own company’s insurance adjuster or the other parties involved may use recorded statements to deny your claim or trick you into settling your claim before you know all of the long-term effects associated with your injuries. Do not ever give a recorded without having an attorney who represents you present. Juries do not get to see the whole picture. In a civil court of law, much of the police report must be marked out so the jury cannot see it. Evidence of the other driver’s insurance coverage is generally not admissible in evidence. Insurance companies do not have to tell you how much insurance coverage their insured has unless you file a lawsuit and force them to do it. Thus, if your damages are likely to exceed $30,000 (the minimum limits required), you may need to file a lawsuit to find out how much coverage there really is. You may have an obligation to pay back your health insurance company out of any settlement or judgment. If you have health insurance, the policy usually contains what is known as a “subrogation clause.” In plain language, this means that both you and the car insurance company may have an obligation to reimburse your health insurance company out of your settlement. The insurance adjuster does not have to tell you before you accept a settlement offer that a chunk of that offer must be paid directly by the auto liability insurer to your health insurer, leaving you with little or nothing. See: Do I have to pay my health insurance company back out of my settlement? When you sign a Release, it is legally binding. When an insurance adjuster offers you a settlement in exchange for signing a release, you are giving up all of your rights specified in the release for injuries you know of now, as well as those you discover in the future. Don’t sign a property damage release until you are sure they have covered all of the damage and you have verified that your bodily injury claim is not incorporated in the release. It is best to have a car accident lawyer review all releases before you sign so that you completely understand what you are giving up. As you can see from the above, there are a number of risks you take by not having an accident attorney on your side to explain all of the consequences of your actions and of the decisions the insurance adjuster may push you to make. Call us for a free consultation today. For more information on handling car accident claims, please visit: Tips for Filing Claims Against Car Accidents. Not all car accident lawyers are the same either. Shouldn’t you have one with decades of experience handling the tricks adjusters will throw at you? Call Simmons and Fletcher, P.C. today. If you have suffered from any of the above, more information on the effects of those injuries can be found on the related injury page. It costs you NOTHING to speak to our car accident lawyers. You need to know the consequences of your actions before you go down the wrong path and do damage to your own case. At Simmons and Fletcher, P.C., we offer a 100% FREE initial consultation. You can come in and speak with an automobile accident attorney about your case. We will tell you what expect and what to lookout for. At the end of your consultation, if you decide not to hire us, you do not owe us a dime. If you do decide to hire us, we work on a contingency fee basis. That means our fee is a percentage of the recovery we make on your case. If we do not make a recovery, you do not pay us a dime. Call 1-800-298-0111 to set up your consultation today. Can a car insurance company deny payment of my medical bills after a car wreck? Tips for filing injury claims against auto insurance companies. Will my auto insurance rates go up if I file a claim? What is the difference between a first-party and a third-party insurance claim? Why do I need my UIM permission to settle with other drivers/tortfeasors? What is a MIST claim? What constitutes a minor impact collision? What is covered by the Texas liability auto insurance policy? Will auto liability insurance cover intentional acts? What claims do passengers have? 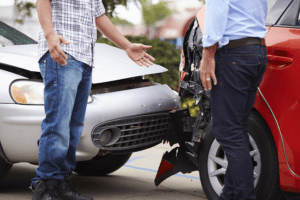 Who is at fault in a rear-end auto collision? Who is liable for a tire blowout? Who is liable for a car accident caused by malfunctioning traffic signal lights?